Every year at the end of November I make a photo book. The tradition started two years ago. My Christmas plans that year were shaky, and my Christmas the year before had been…not super Christmas-y. So I sat down and thought about what I could do that would make the day special. And the idea I came up with was the yearly photo book. 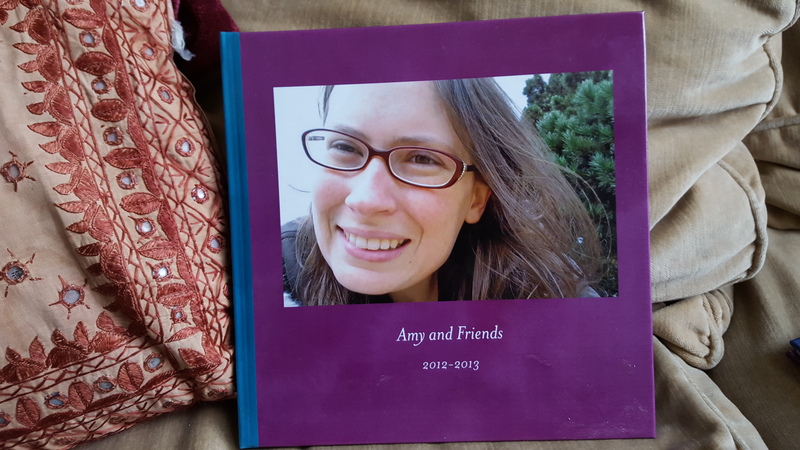 Here’s what I do: I put together all my photos (and friends’ photos) from the previous year, and I combine them into a beautiful, customized hardcover book. When the book is shipped to me, I am not allowed to open it and look at it. Instead, I wrap it up right away and am not allowed to open it until Christmas. It turns out this idea was completely inspired. There is no way I’d rather spend part of my Christmas Day than by looking at photos of the people I love and the special times I’ve had over the course of the last year. It is hard for me to feel lonely while doing such a thing, and it is very, very easy to feel grateful. Now I think about this tradition all year long. I do a better job remembering to take photos throughout the year, and sometimes I tell people, “I want this photo for my photo book,” and it makes them a part of the tradition. I put it out on the coffee table for my friends to enjoy as they wish. And I think I will really enjoy having a visual record of many of the important people and events in my life in the future as well. Of course, I always have the digital files of the photos, but looking through the books is more a curated and intimate experience. 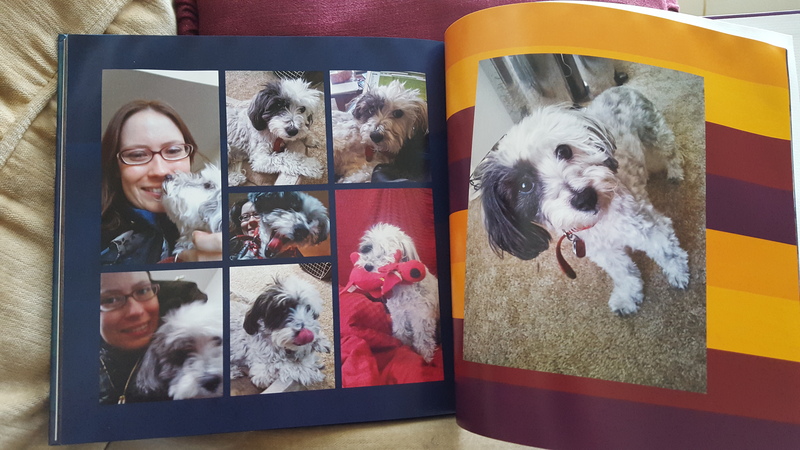 I used two years worth of photos for my first book. And here, have a Nala spread! I use shutterfly.com to make my books. Their layout interface is a little glitchy, but it could be worse, and I like how many options they offer. That being said, these photo books are expensive, and I suspect there are cheaper options out there. If you do use shutterfly, never pay full price. Instead, wait until they have a promotion, which they seem to have constantly. You can build your book and save it and wait until the best (cheapest) time to buy. You should be able to get 50% off your book and free shipping. This year I got 50% and a free photo calendar. One of the most time-consuming tasks is culling your photos and getting them all onto shutterfly. I try to do a little of this work ahead of time by downloading likely photos from Facebook as they are posted and putting them in a special folder. The more you can organize your photos ahead of time, the easier it will be to put together your book. I like to have a balance between some large photos that take up most of the page, and some collage pages that contain multiple photos (occasionally I do up to 16 on a page). That way I can highlight particularly special moments or great shots while also not having to cull so aggressively, which comes in handy when I’m faced with the several hundred cute photos of Nala that I inevitably have by the end of the year. I do multi-page spreads for important events like trips and my birthday party, but I also like to include spreads that highlight my more everyday life. This year I included lists of the concerts, plays, and movies I’ve seen, and I have spreads for blues dancing, playing board games, yummy foods, and cute Nala photos. 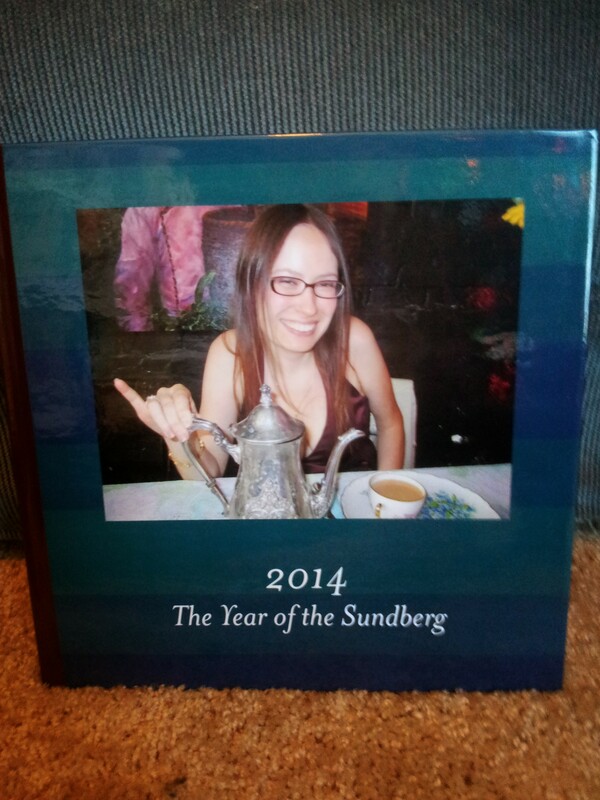 I’m really looking forward to getting to see my 2015 photo book. Only a few weeks left to wait!